A former principal with Pennsylvania Ballet, Julie Diana is the executive director of Juneau Dance Theatre in Alaska. Naomi Glass, teacher at Pacific Northwest Ballet School, knows firsthand the advantages and challenges of hypermobility. As a young dancer, she was told to keep her hyperextended knees in a straight position far from her full range of motion. "It felt too bent to me," she says. "But once I was able to access my inner thighs and rotators, I found strength and stability and could still use the line that I wanted." Hypermobility occurs when joints exceed the normal range of motion. Dancers can have hypermobility in specific joints, like their knees, or they can have generalized laxity throughout their bodies (which is often measured using the Beighton system—see below). While this condition may enable students to create beautiful aesthetic lines, it can also increase risk for injury. Help dancers gain the strength they need to stay healthy while making the most of their hypermobility. When Lindy Fabyanic opened her school, Dance Conservatory of Charleston, she called on friends and former colleagues to find guest teachers and build her faculty. "I started texting my network to see if they wanted to come teach workshops or master classes," says Fabyanic, former dancer with San Francisco Ballet and New York City Ballet. "It was so heartwarming to get their positive responses and feel their support." Whether your studio is new or well-established, the easiest and most effective way to find potential candidates is to reach out to people you already know. A strong, trusted faculty will ensure that students receive the best training and experience possible. But it can be challenging to recruit highly qualified teachers if you don't have direct access to a large network of professionals in your area. Even when you find the right people, how do you retain them in a competitive market? Try these creative and expense-free strategies to help build the right team for your school. You might think ballet competitions are all about the dancers—offering them valuable exposure, scholarships and job opportunities. They serve as vehicles for growth, with dancers spending countless hours working to perfect every step they'll take in front of the judges. But these same events have also become a way for choreographers to launch their own careers. The competition work they make helps to refine their voices, and it offers the chance to dive further into the creative process with pre-professional students. DT spoke with five award-winning choreographers about their roles on the ballet competition circuit, and how this unique opportunity has both inspired and elevated their craft. At Grand Rapids Ballet School in Michigan, ballet master Attila Mosolygo often changes the order of his barre combinations. One day, he might give an adagio before grand battements; the next, he'll save adagio for last. Like most teachers, he follows a general progression—pliés to start, strength-building battements or stretches to finish—but allows for variance to accommodate class level, timing and personal preferences. A classical ballet barre is a model warm-up routine: It gets large muscle groups moving first and then progresses through a series of exercises that grow in speed, range and complexity. This start to class helps students find balance and work on fundamentals as it prepares them to dance unsupported in center. But that doesn't mean you need to follow the same script every class—especially if you want to keep your students engaged. "I don't think a specific way is better," says Mosolygo. "If dancers do everything the same all the time, they're less adaptable." Dancers at the University of Arizona recently performed Jerome Robbins' Antique Epigraphs, an ensemble piece for eight women that requires intricate linear formations and walking in unison. "It was super-challenging for us," says dance professor Melissa Lowe. "Students needed a heightened sense of awareness, or it wasn't going to happen." Lowe asked dancers to use their intuition and aural sensibilities to help determine where they needed to be, when they should be there and how to get to those places—together. 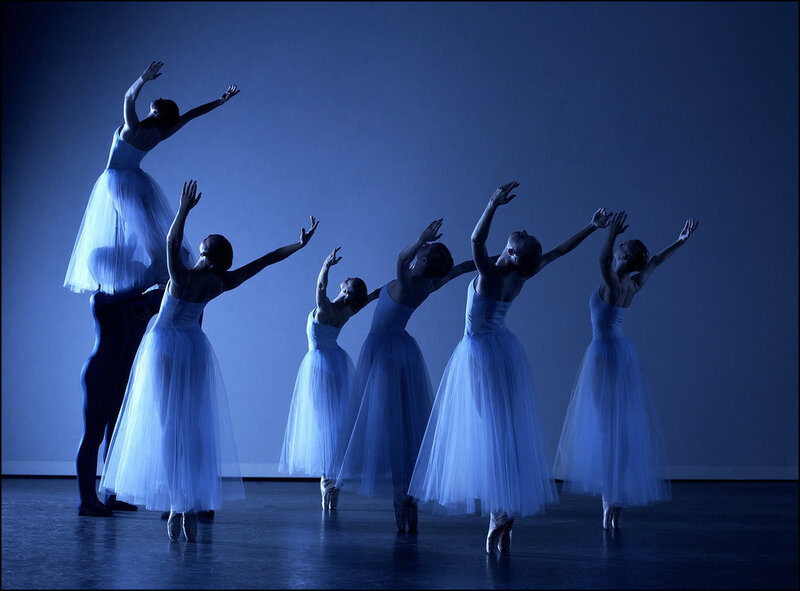 Teaching dancers to work in unison, whether as a large corps de ballet or small ensemble group, is an integral part of their training. It requires teamwork, attention to detail and thoughtful preparation for a successful group effort. Teachers need to provide the right steps and counts to ensure cohesiveness, of course. But how you set the material will also encourage dancers to be in line and in sync—while still allowing them to be individuals. Missing dancers can be disastrous for a group piece. "If it's a studio production, there has to be an agreement up front for students who want to be involved," says Lorita Travaglia, ballet mistress at Colorado Ballet. "When one person is missing and doesn't know what they're doing, it really does affect the whole group." Understanding the importance of commitment is a crucial part of dancers' (and their families') training. "They have the responsibility to everyone, not just themselves," she says. Imagine that your studio has a new 12-year-old student, who is interested in studying ballet. She has no formal training, yet she wants to take class with her peers. Where do you place her, and how do you ensure she gets the necessary foundation and stays excited and engaged?